Streamline Pictures was one of the first American companies formed to license Japanese animation for American distribution – with the goal of presenting the original anime uncut, leaving the original music and sound effects intact, and providing an accurate English language dub. “The first” depends on whether you go by theatrical or video releases. Streamline Pictures released its first theatrical feature in March 1989, but its first video was not until February 1990, while The Right Stuf released its first video in June 1989. I was an anime fan throughout the 1980s. I was also on the organizational committee of the 1984 World Science Fiction Convention, in Los Angeles on August 30 – September 4 (L.A.con II). I was responsible for that Worldcon’s bringing Yoshiyuki Tomino from Tokyo as a special guest, and for inviting Harmony Gold U.S.A. and its producer Carl Macek to give a presentation on the Japanese Macross TV cartoon series that it had just licensed for the first legal (as opposed to illegal fan video copying) anime home video sales in America. Harmony Gold only produced the first episode of Macross before the series was sold to American TV as the first part of Robotech. (It looked until almost the last minute that the Worldcon would have to cancel its announced Macross #1 video premiere, but Macek got it finished the day before its scheduled Worldcon premiere.) Macek became the producer of Robotech. I later interviewed him at the Harmony Gold offices in Los Angeles for a lengthy article on Robotech in Fantagraphics’ then-monthly magazine, Amazing Heroes: “ROBOTECH: Japanimation Invades Comics With a Trio of Comico Titles” in Amazing Heroes #75, July 15, 1985, pgs. 25-34 (pictured at right). As an active member of L.A.’s Cartoon/Fantasy Organization chapter, I was marginally aware post-Robotech that Macek had left Harmony Gold, had partnered with Jerry Beck who had come to Hollywood from NYC’s C/FO chapter, and that they planned to start a company to professionally license Japanese animation for America. I and the L.A. C/FO enthusiastically encouraged them. 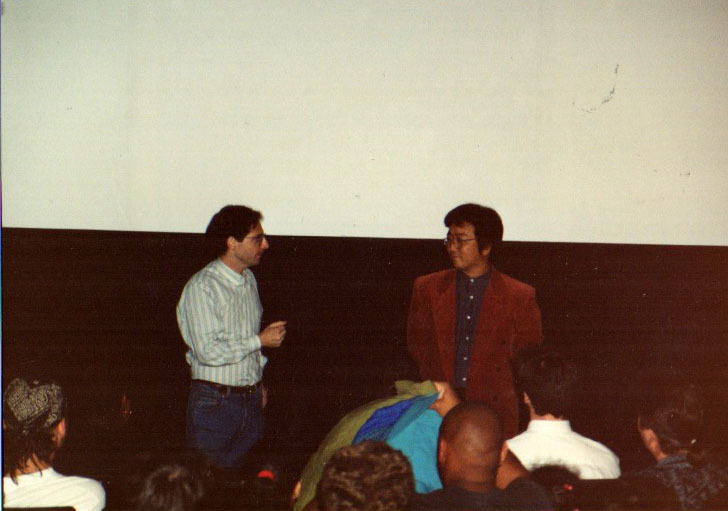 When they got started around late 1988, I gave them free consulting on what anime movies and TV series were the most popular with American fans, and would be the best to license for the public. I also wrote the first articles about the company and its titles for the new American animation magazines: “Laputa & Twilight of the Cockroaches” in Animation Magazine #8, Spring 1989, pgs. 21 [and] 59, and “Japanese Animation: The Cult Grows Up” in Animation Magazine #12, v.3 #4, Summer 1990, pgs. 28-30. When I was laid off from my 20+-year job as a corporate technical librarian at Hughes Aircraft Company in mid-1990, Carl & Jerry persuaded me to become a full-time Streamline Pictures employee, its first, instead of looking for another librarian job. I joined Streamline in January 1991, and was its last employee when Streamline went out of business in March 2002. 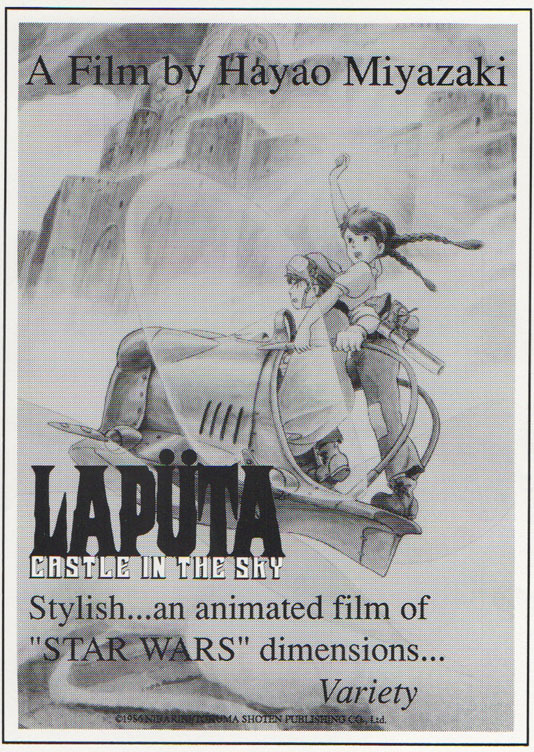 This original Japanese poster for Laputa: Castle In The Sky was also used by Streamline to promote its U.S,. release. This series of posts are my observations of events at Streamline Pictures during my tenure. But first, let’s go back a few years to see how the company came together and what it had achieved before I joined up. Jerry Beck – who edits this esteemed website – had a background in film distribution, having worked by day for United Artists, MGM and Orion in New York City. 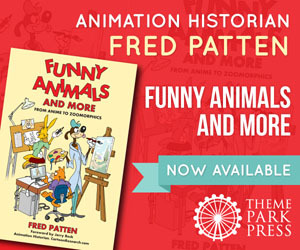 In his off hours he was writing books and articles about Hollywood animation and running the Cartoon/Fantasy Organization-N.Y. 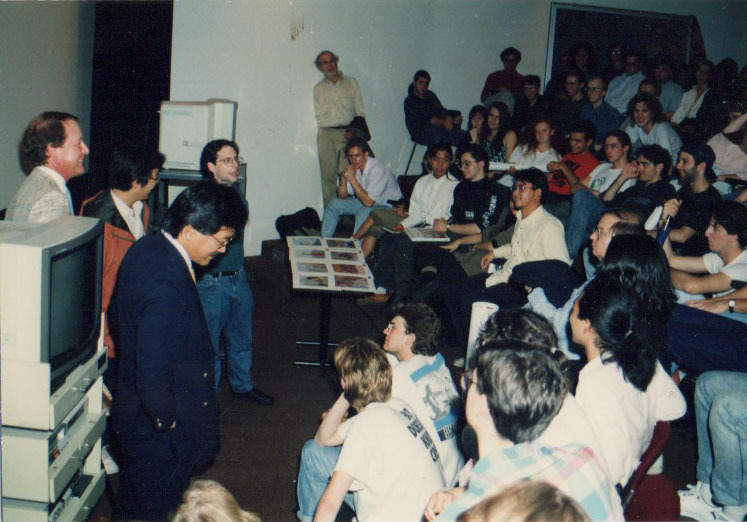 He was the first person to show anime in 16mm at the New York Comic Cons – borrowing 16mm prints from Tōei’s New York offices. He never forgot how Great Mazinger looked like on the big screen – and the fan reaction to seeing anime on the big screen. Jerry moved to L.A. in 1986 to work with Terry Thoren’s Expanded Entertainment – distributing independent and foreign shorts, packaged as festivals, to theaters; starting Animation Magazine; and curating events for a local international animation festival (Animation Celebration) held in 1985, 1987, 1989, and 1991. (He worked on the 1987 one.) Beck encouraged Thoren to screen of Miyazaki’s Laputa: Castle In The Sky and Carl Macek’s Robotech: The Movie at the Animation Celebration. Carl Macek was an animation producer and writer who had become the mastermind behind Harmony Gold’s Robotech series. 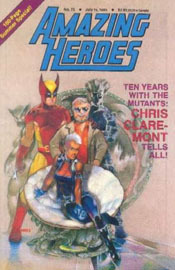 Macek and Beck had informally met at the 1986 Comic Con where Carl was selling animation cels on behalf of the producers of Heavy Metal (Carl wrote the official tie-in book, The Art of Heavy Metal, in 1981). As Beck recalls it, “Laputa and Robotech – and a Computer Animation program – were the only sold-out shows in advance of the Animation Celebration festival. I tried to talk Terry Thoren into picking these films up for us to distribute – but he wasn’t interested in distributing what he called “Saturday Morning Cartoons”. Terry had programmed Robotech: The Movie to run opposite an opening night party for the elite Hollywood animation crowd. Carl and I snuck away from the party to watch the crowd reaction to Robotech. I still recall both the reactions of the audience – they were totally involved – and was impressed how good the anime looked on the big screen. I appointed myself the company historian, but I could never find out when Streamline Pictures officially turned from Carl & Jerry’s informal idea into a legal business. Neither had any sense of historiography, and to them a business license with a date, and the paperwork of their licensing of the first Streamline title, was just useless bureaucracy to be lost or thrown out after it was no longer needed. If I had asked Los Angeles’ Office of Finance’s Custodian of Records at the time, I probably could have found out, but today all records that old have been destroyed. The best backdating that I could do was that the company got its business license and filed its fictitious name notification around October or November 1988, when Carl & Jerry were still operating from their homes, a couple of months before Streamline Pictures opened its first business office. That was in February 1989, at 5625 Melrose Avenue, Hollywood, CA (taking over a two-room office suite from Quality Sound, the facility used to dub Totoro and Kiki), sharing the space with John Kricfalusi’s fledgling Spümcø animation studio. 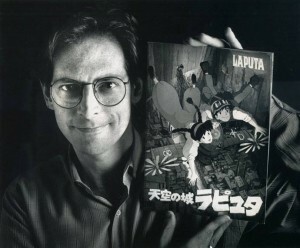 Photo of Jerry, used in the San Francisco Chronicle, to promote the 1989 screening of LAPUTA at the Roxie Cinema in San Francisco and the U.C. Theatre in Berkeley. Click to enlarge. 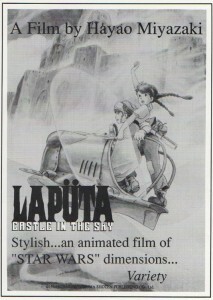 Streamline’s first release, a 35mm English-dubbed print of Hayao Miyazaki’s Laputa: The Castle in the Sky (Streamline got one print, already dubbed for Japan Air Lines’ in-flight entertainment, from Tokuma Shoten), premiered at the Roxy Screening Rooms in Philadelphia, PA, on March 24 – April 6, 1989. Streamline got a very short one-year license for Laputa, from March 1989 through February 1990, renewed once for March 1990 through February 1991. Tokuma would not renew it again. Streamline revved up during 1989. Its second theatrical release was Hiroaki Yoshida’s allegorical live-action/animated Twilight of the Cockroaches (subtitled), which premiered at the Music Box Theatre in Chicago, IL, as a Friday Midnight Special on May 5, 12, and 19. It played a two-day engagement on May 25-26. 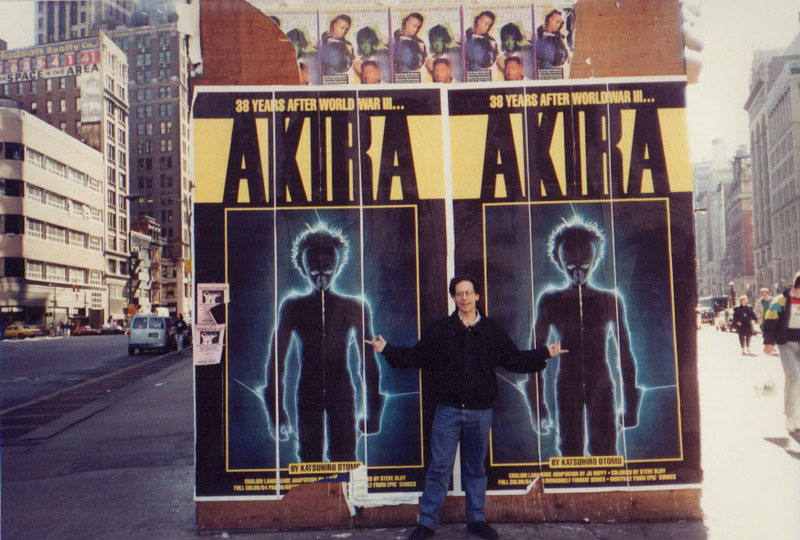 Streamline’s third release was Katsuhiro Otomo’s Akira, which played for 2½ weeks at The Biograph in Georgetown, Washington, D.C., from December 25, 1989 to January 11, 1990. 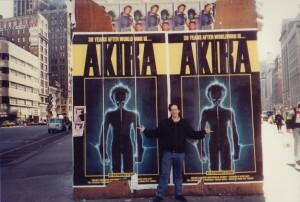 Streamline got two 35mm prints of Akira, and showed the second at an overlapping screening at the Cinema 21 in Portland, OR from December 29, 1989 to January 4, 1990. 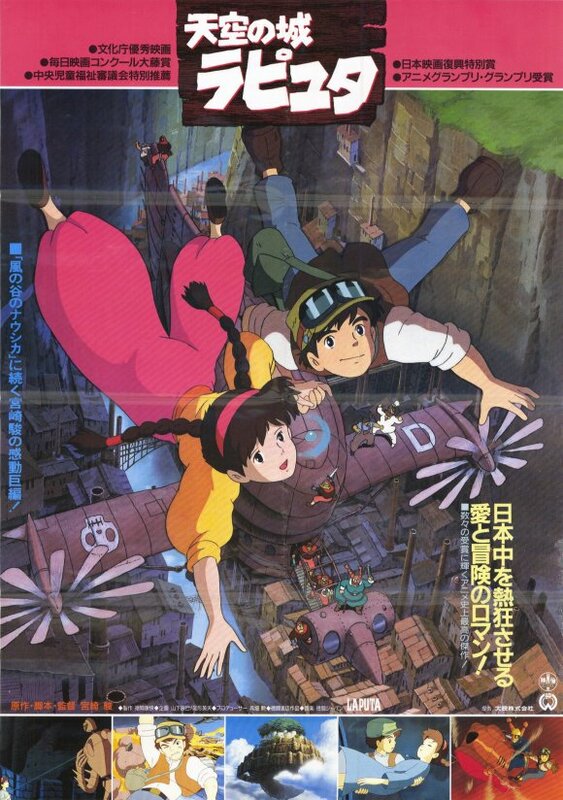 Streamline was also busy during the last half of 1989 dubbing Hayao Miyazaki’s My Neighbor Totoro and Kiki’s Delivery Service into English for Tokuma Enterprises Corporation (which still owned Studio Ghibli then), for Tokuma to sell as bilingual in-flight movies for Japan Air Lines’ trans-Pacific flights. Carl was the director, and Jerry is credited on screen as ‘production manager’. Carl didn’t think much of the dubbing that Tokuma had gotten, and boasted that he could do better. Tokuma gave him the chance to prove it with My Neighbor Totoro. Its and Kiki’s Delivery Service’s dubbings kept Carl busy during the last half of the year. Carl dubbed My Neighbor Totoro during September, and Tokuma was pleased enough with it that it gave him Kiki’s Delivery Service during November. But Tokuma would never license either movie to Streamline Pictures for theatrical release in America, although Carl’s English-language dub of My Neighbor Totoro was later licensed by Tokuma to Troma Inc.’s 50th Street Films for theatrical release during May 1993 (and later released on DVD by 20th Century Fox Home Video). Carl and Jerry meet the fans at the 1990 San Diego Comic Con. In August, Streamline was an exhibitor at the San Diego Comic-Con the last year that it was at the downtown Convention and Performing Arts Center. Streamline also presented a Festival of Japanese Animation at the Spreckles Theater on August 2 – 4, for the attendees of the 1990 San Diego Comic-Con. 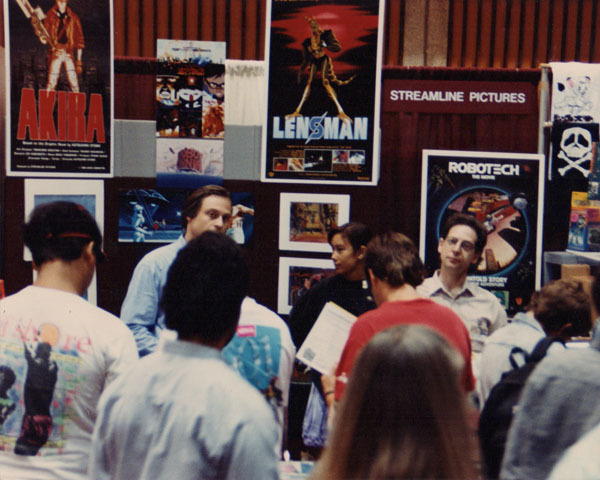 The Festival included sneak previews of Lensman (with a Japanese promotional button), Robot Carnival, and Manie-Manie (Neo-Tokyo), which Streamline was producing for American theatrical release, along with Akira, Laputa, and Twilight of the Cockroaches. Lensman was theatrically premiered later that month on August 31, simultaneously at the Neptune Theatre, in Seattle, WA (to September 6), and at The Biograph, in Georgetown, Washington, D.C. (to September 13). 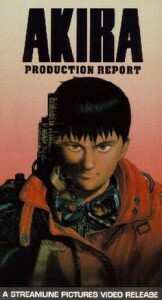 Lensman, produced by Studio Madhouse, was one of the world’s first theatrical releases (as opposed to private computer-technology conventions) to feature computer graphic imagery (CGI). 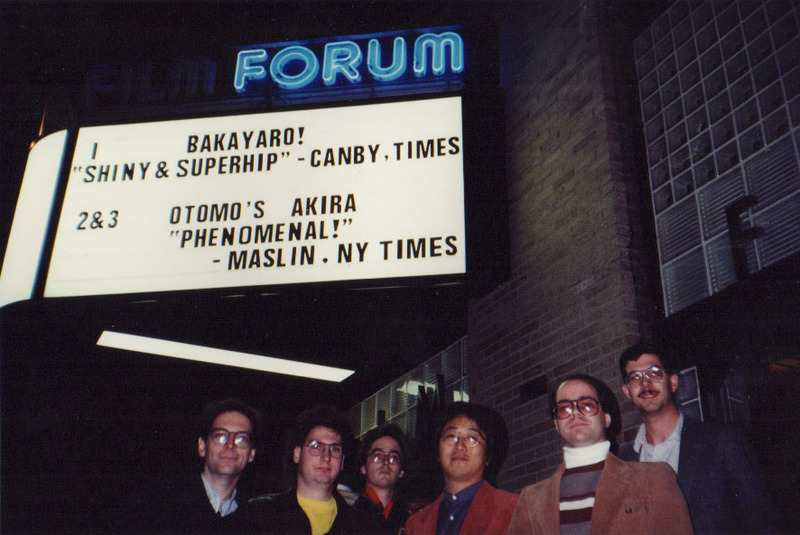 Jerry (left), Otomo (in center) with fans under the marquee of the Film Forum. In December, Akira became Streamline’s second video release, and the first under Streamline’s Video Comics label, designed for promotion and sales in comics-specialty shops. Streamline also released the first episode of Zillion, the first anime dubbed especially for the American home video market. (The acquisition of Zillion reestablished Carl’s ties with Tatsunoko Production Co., Ltd., the original producers of the Japanese TV animation which he had made into Robotech for Harmony Gold U.S.A.) By then VHS had completely replaced the earlier Betamax format. That is where Streamline was when I joined the company in January 1991. 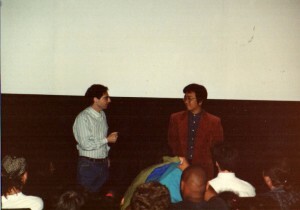 Jerry was concentrating on Streamline’s theatrical distribution – the company had Laputa, Twilight of the Cockroaches, Akira, and Lensman by then, and was just getting Robot Carnival that month – and Carl handled everything else, mostly all the dubbing of the theatrical features and the planned home video releases. Carl often worked, then and later, with independent film writers and voice actors such as Bob Bergen, Steve Bulen, Bill Capizzi, Frank Catalano, Ardwright Chamberlin, Michael Forest, Barbara Goodson, Steve Kramer, Wendee Lee, Melanie MacQueen, Michael McConnohie, Edie Mirman, Mike Reynolds, Cliff Wells, Jeff Winkless, and Tom Wyner on the dubbing. Streamline’s English-language theatrical posters were being designed and adapted from the original Japanese posters by Carl’s wife, Svea. This column covered Streamline Pictures to about the beginning of 1991. More next week. THAT was an awesome trip down memory lane! Some of THE nicest, most generous people I’ve ever worked with. You don’t know the good old days are the good old days when you are living em. You take much for granted. These were good old days! Always great to see Fred’s articles. It may have once been a topic of heated debate among fans regarding just how adequately did Streamline meet their goal to provide an accurate English language dub and so on, but it’s all squarely in the realm of history now. I eagerly await the next parts. I recall Chris’ name pops up in the end credits to “Lensman” and figured he was probably responsible for the fireball effect in the “Streamline Pictures” logo. Years before I saw a film he made separately called “Pencil Dance” which is really more tech demo of the effects he could give his clients. The fireball effect shows up at the end of this (T2 wouldn’t be out until a few years later by the way). Its and Kiki’s Delivery Service’s dubbings kept Carl busy during the last half of the year. Carl dubbed My Neighbor Totoro during September, and Tokuma was pleased enough with it that it gave him Kiki’s Delivery Service during November. But Tokuma would never license either movie to Streamline Pictures for theatrical release in America, although Carl’s English-language dub of My Neighbor Totoro was later licensed by Tokuma to Troma Inc.’s 50th Street Films for theatrical release during May 1993 (and later released on DVD by 20th Century Fox Home Video). That is kinda weird that they didn’t let Streamline release those theatrically. At least we got Totoro at all though never Carl’s version of Kiki sadly (I thought Lisa Michelson did a great job on that). Tokuma Shoten bankrolled Studio Ghibli for about its first dozen years. We at Streamline felt that Tokuma was using us to test-market Miyazaki’s films in the U.S. I have the reviews that we got of “Laputa” coming up later. Tokuma knew that Miyazaki’s Ghibli features were the equivalent of solid gold in the American market, and did not intend to fritter them away to the tiny anime-specialty distributors, despite all of us pleading for them. Tokuma, which is one of the largest publishers in Japan, could afford to wait until it sold the Ghibli films to (1) a major cinematic distributor that (2) would promise contractually to not “improve” them. It finally got this with Disney. Wow Chris – I know Pencil Dance, but I never noticed the “fireball effect” was used in it. I recall Casady saying it was in T2… or going to be in T2… but maybe I got it wrong (or it’s in T2 as well)? Casady kept his “stock animation effects” in a file cabinet and I watched him pull the artwork out of a file to show it to me. Thanks for pointing this out. Glad to help. I didn’t know how important it was to point it out or not. Just something I noticed almost 20 years ago after having saw the short in on the tape “Animation Celebration Vol. 2” (having already see a few Streamline titles by then). It certainly was a long wait but paid off well. Aha! I just found a review from the “Philadelphia Inquirer”, March 24, 1989, of Streamline’s “Laputa” release that says, “this is […] Streamline Pictures’ first release, after the company opened in October 1988.” So there’s a definite month for those who want to know when Streamline Pictures got started. As Jerry says, he & Carl had already gotten started unofficially before they officially launched Streamline Pictures in October 1988. This is absolutely fascinating. It’s very interesting for me to see how this history happened since every time I hear a history of anime releases in the US there seems to be a different “first”. I’ve heard that Animeigo was the first release with MADOX, but now I see that it could be Right Stuf with whatever they released first. I also had no idea that the first video Streamline released wasn’t actually anime, but a Making of. We’d very much like to interview Fred for our podcast if Fred ever feels up to it. Thanks so much for this article and I look forward to the rest. You learn something new each day. 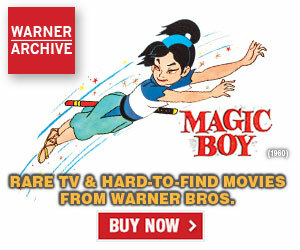 I believe that first Right Stuf release was the first of their Astro Boy tapes. Hopefully that can happen one day (say, the 10th anniversary episode, it’s coming up!). Well, I’m amenable to an interview, but it’d have to be either via e-mail or in person. It’s almost impossible for me to talk over a telephone since my stroke. If it’s in person in my wheelchair, are you in the Los Angeles area? Contact me at fredpatten@earthlink.net to set up a time & place. I’ve found an old list that I compiled at Streamline Pictures of all the anime companies’ first releases, that I’ll turn into a column when I’m finished with the Streamline history. Yes, “MADOX-01” was AnimEigo’s first release, but on 1 April 1990. By then The Right Stuf had released its “Astro Boy” #1 on 1 June 1989, and U.S. Renditions released its first two videos, “Dangaio” #1 and “Gunbuster” #1 at the Los Angeles Comic Book Convention on 25 February 1990. As I said, Streamline Pictures’ record is complicated with its theatrical premiere of “Laputa” on 24 March 1989, its first video the live-action documentary “Akira Production Report” at the L. A. 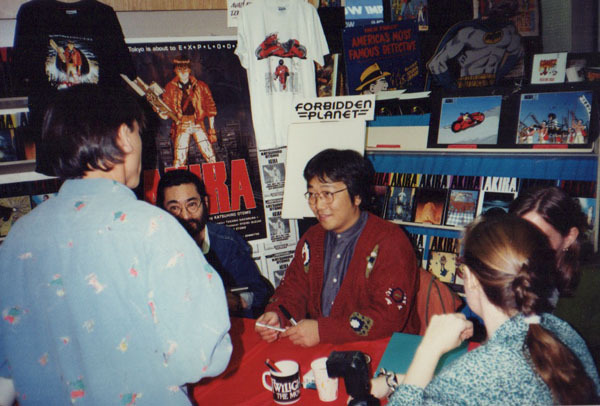 Comic Book Convention on 25 February 1990, and its first anime videos being the “Akira” feature and the “Zillion” #1 episode that December. I really like your article! I’ve become tremendously fond of Streamline Pictures and their dubs, including their great dub of Totoro. I have to admit Streamline did a good job dubbing Totoro into English. I wish that Disney included the Streamline dub of Totoro on their DVD and Blu-Ray. I am also surprised that Streamline dubbed Kiki’s Delivery Service before Disney did. As much as I like Disney’s dub, I am eager to watch Streamline’s dub of Kiki (I listened to some sound clips and I thought Lisa Michelson did a great job acting like she did in Totoro). I also wish Disney would include the Streamline dub of Kiki’s Delivery Service on their DVD and Blu-Ray (possibly a future release). I never stop hoping that might happen. After all, Totoro and Kiki are two of my favorite Miyazaki films. If you have time, please respond. I don’t know what to say. Carl dubbed Totoro and Kiki over a year before I began to work at Streamline Pictures, so I only heard about them after the fact. Carl and Jerry both expressed disappointment that Streamline was never allowed by Tokuma to show them in the U.S. Carl felt somewhat “betrayed” when Troma’s theatrical division was allowed by Tokuma to theatrically distribute Totoro in 1993. It was all presumably part of Tokuma’s test-marketing of Studio Ghibli’s movies in the U.S.
You were on the organizational committee of the 1984 World Con? My dad was apparently involved with the organization too. He got caricaturized on the cover of one of the progress publications, which was included in the main con program. He was riding a Disney-like ride with his second wife and thinking, “The force is strong in this one.” We went to the convention for a few hours on the same weekend as my first trip to Disneyland. I kept the program for years, until I had a falling out with my dad; then I threw the guide away. I’ve since regretted doing this. I still have the con badge. We’ve since reconciled, and he is the person who pointed me towards furrydom, years after criticizing my favorite Saturday morning cartoons as stupid. I just wanted to say Fred that I am looking forward to you later entries. I also have your Watching Anime, Reading Manga book to finish up (as in…. I’ve had it for a good while but haven’t dove into it yet). I more than likely have your articles you wrote for Newtype USA in the past in a box in my storage closet that I’d like to bring out and scan on my personal blog over at animeofyesteryear.blogspot.com. I know in a recent AWO podcast Daryl mentioned he would like to see those articles you did, which more than likely I have from the first year or so of Newtype USA being in print. I’m curious if you wrote the one article about how Robotech/Macross kept changing hands over 20 yeras, which would have been in line when ADV put out the Macross set a few years after AnimEIgo did. If you ever happen to be on the AWO podcast, I will no doubt give that a listen. I am glad you are still alive to do these online articles, and hearing about Streamline has peaked my interest even more.